It’s the most anticipated distillery opening of the decade, yet Macallan has kept remarkably quiet about its £140m architectural marvel – until now. Becky Paskin was one of the first in to take a look around. ‘It’s almost like a Bond villain’s lair,’ Macallan’s creative director Ken Grier says, laughing to himself. ‘It reminds me of the volcano out of You Only Live Twice.’ Ever since designs for the whisky brand’s uniquely disruptive subterranean distillery were revealed in 2012, the pop culture comparisons have flowed. So freely, in fact, that rumour has it that the top bods at Edrington, Macallan’s owner, have forbidden employees from even mentioning the Teletubbies. The undulating formation of the distillery’s roof may be reminiscent of the loveable TV-stomached aliens’ residence, but in reality Macallan’s new brand home couldn’t be less childish. The structure, which took six years to develop, a workforce of more than 400 tradespeople, a team of award-winning architects and designers and a whopping £140m investment, is nothing short of breathtaking. Alexander Reid wouldn’t recognise Easter Elchies today. Having obtained the first licence for Macallan in 1824, then little more than a farm distillery, Reid would no doubt be amazed at how his small concern has been transformed. The original distillery was refurbished and extended countless times over the years, always in line with the growth of single malt, but in 2012 the decision was made to abandon the site altogether in favour of ‘doing something disruptive’. 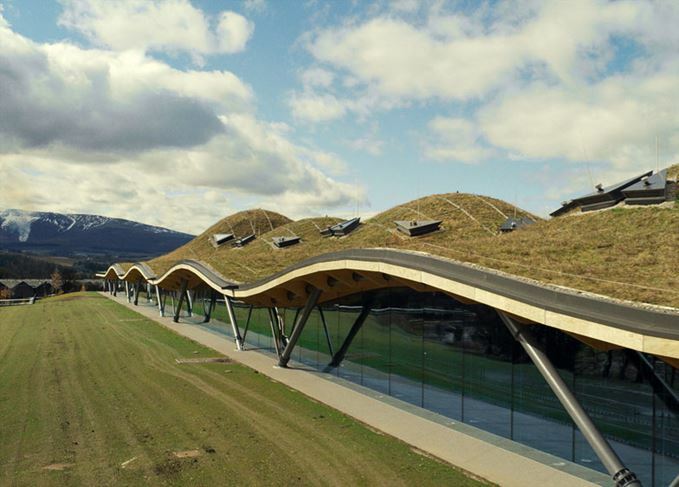 Bond lairs and underground alien homes aside, inspiration for the distillery actually came from the Bodegas Ysios winery in Rioja Alavesa, Spain, which features an aluminium wave for a roof that blends into the scenic mountain backdrop. Macallan’s roof, however, was constructed from 2,500 individual sheets of Scandinavian spruce that slot together perfectly. Covered instead with a grass and wildflower blanket, Macallan’s waves are designed to mimic the rolling hills of Speyside, camouflaging it into the cliffs above Craigellachie. The roof in itself is a significant feat of human engineering – a giant puzzle held together by precision. No glue. No nails. The building is designed to move with the weight of the roof, which has undergone Swiss Alpine snow tests, in case a blizzard should hit Speyside and bury Macallan under several feet of snow. Even the glass fins supporting the window running the length of the distillery’s south side are made to withstand the weight and breathe in time. Steel columns, while practical and surely sturdy, were thought to obstruct visitors’ otherwise pristine vista of the valley and Easter Elchies House below. ‘The vision was always ambitious, but this enabled us to challenge our own thinking to create something so dramatic and awe-inspiring,’ Graham Stirk, lead architect and senior partner at Rogers Stirk Harbour + Partners (RSH+P), explains. The visitor experience, and the delivery of that ‘wow’ factor was always a key consideration in the distillery design. So much so that even a lighting designer was employed to make the distillery stand out like a beacon on the hill, giving the folks in Craigellachie below a glimpse of Macallan’s aura. The person responsible for breathing life into the entire visitor experience has been project manager Adele Joyce, who worked with Grier and Stuttgart-based museum design specialist Atelier Brückner to create what is billed as the most awesome distillery visitor experience in Scotland. The ‘six pillars’ that underpin the brand’s ethos are brought to life in a delightfully interactive and almost magical fashion, satisfying the curiosity of the most hardened whisky enthusiast. From a moving glass sculpture displaying a rainbow of colours found in Macallan single malt, to a moving oak ‘forest’, each interactive ‘pillar’ requires visitors to get hands-on. Perhaps the most satisfying exhibition of all is that for the Peerless Spirit, in which a single drop of liquid levitates before visitors’ eyes before sending a wave of white light to illuminate a display of Macallan expressions. The visitor experience also features the Macallan archive – a collection of 398 historic bottles, plus 19 decanters and four flasks, that has never before been displayed to the public. Now, with it safely in its new, permanent home at Macallan, visitors are invited to explore the archive via a digital periscope. The surprises don’t stop there. Beneath a circular bar designed like a Roman amphitheatre lies the cave privée, a private hosting space that looks out onto 150 privately-owned casks silently maturing within the distillery’s foundations. Of course, like any good visitor centre, or distillery experience designed by a museum specialist, a visit to the gift shop and café is a must. The architecture is ground-breaking for a Scotch whisky distillery, while the visitor experience has been developed to a level more at home in a world-class museum. However, when it comes to the distillery itself, innovation takes a more relaxed approach. The most innovative aspect of the distillery – and the most challenging from a production perspective – is its layout. Macallan’s 36 stills – the biggest single order from coppersmith Forsyths, according to Grier – are arranged in three circular ‘pods’ of 12. Each pod contains eight spirit and four wash stills, alongside stainless steel washbacks. That many stills in one room is bound to generate an exceptional amount of heat, impacting the success of fermentation within those adjacent washbacks, a process which is extremely temperature-sensitive. ‘You’re getting a still house that’s part of the tun room, so that ambient temperature is changing. Therefore you have to think about the technology you need to hit your fermentation,’ says Savage. As such, the original distillery’s wooden and stainless steel washbacks have been rejected in favour of fermenters fitted with a new external cooling system that allows for greater control over temperature during fermentation. Savage explains that, had the technology not been available, the entire distillery design would have to be redrawn. ‘You can do anything weird and wonderful with the building and we can focus on developing our experiential part of the distillery, but if it affects the new make in any way shape or form, then we don’t do it,’ he says. The changeover from the old distillery to the new has been the biggest challenge for Savage and his team so far. The original site was switched off in October 2017, its low wines, heads and tails captured and used for the first few runs at the new site just weeks later to enable the team to achieve the perfect distillery character as soon as possible. The £140m spent by Edrington in creating a legacy for Macallan in Speyside is just a small share of a larger £500m investment in the brand over the next 12 years. Plans are well under way to build more warehouses on-site – there are currently 54 at Easter Elchies, plus a further eight being constructed in the next six years. Master of wood Stuart MacPherson also has hopes for a cooperage on-site, a project he calls ‘one of the final pieces in the jigsaw’. With any legacy project comes a commitment to the surrounding environment, and Macallan’s new distillery is no exception. At least 90% of its energy requirements will come from renewable sources by the end of 2018, primarily through intelligent heat recovery and biomass. With Macallan now selling more than 750,000 cases of single malt each year, and with Edrington targeting quadruple growth for the brand within the next 25 years, a larger, greener distillery was always going to be on the cards.